Nigerians- sweet and docile, meek, humble and kind. Beware of the day they change their mind. This is my courteous caution to the Nigerian ruling class, as the handwriting on the wall of this nation is becoming crystal clear by the day given the wide disconnect between the government and the governed and its attendant consequences on the citizenry particularly the younger generation. The danger of a growing youth population with an inheritance of poor education, dead infrastructure, mass unemployment which the World Banks puts at 38% and the hope of hopelessness which stares the average Nigerian youth in the face will be the basis of the emergence of a new Nigeria- which might be without blood. 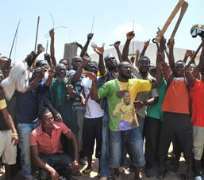 For too long, the Nigerian ruling class has held citizens hostage to their whims and caprices, greed and selfishness. How do you explain the fact that Nigerian lawmakers (#OURNASS) are the highest paid in the world? That with the abundance of our crude oil, we still import refined oil, due to unchecked looting, corruption and embezzling of our commonwealth or what explanation do we give to round-up effect of bad governance in the country? If the irritation and frustration in the land is anything to judge by, then, there is a looming generational war between the ruling elites (older generations) and obviously the younger generation, who are daily reminded of the existence of an insecure and hopeless future in the current make-up of Nigeria. It is specifically delighting that Nigerian youths are now finding their place and voice to challenge the status quo, which has continually kept them in a tight corner as social onlookers. This social reformation spirit and drive amongst the youth must be sustained in demanding and delivering a better Nigeria. As I pen this, there is certainly no hope in sight for the lingering face-off between the Academic Staff Union of Universities (ASUU) and the Federal Government over the non-payment of ASUU' #87billion earned allowances. The impact of this three months old industrial action is of course huge on socio-economic, educational and moral compass of this nation. Yet, #OURNASS annually gulps a sum of #150b. Doing what, you may ask. Let it be known to our #OURNASS that if they do not swiftly act in accordance to the people's wills and aspirations, then the history to follow is better read than experienced. The future of this country is in the hands of the youths who will be willing and ready to sacrifice all for the betterment of this nation first for their own good and that of generations unborn. The mandate for our national legislators is simple, ensure social equilibrium and justice, be transparent and accountable, promote the interest of the people and develop the nation. Disclaimer: "The views/contents expressed in this article are the sole responsibility of Tola Emmanuel and do not necessarily reflect those of The Nigerian Voice. The Nigerian Voice will not be responsible or liable for any inaccurate or incorrect statements contained in this article."